A night out with a friend, munching on some delicious Jamaican cuisine at Spur Tree restaurant in the Lower East Side section of Manhattan, I rocked a sick pair of houndstooth pants I purchased in Midtown. The compliments I got regarding my stylish pants were pouring in like rain. To add to the style, I bought a bottle of New York Colors- Water Street Blue nail polish to match my jacket and what would be hotter than Sally Hansen’s Salon Effects Real Nail Polish Strips in a houndstooth pattern that matched perfectly with my pants? The idea of matching your nails with your outfit never gets old, but when you talk about matching patterns as oppose to just colors, it just puts you in a class above the rest. During my lunch break I sat at an outdoor atrium and polished my nails. Initially, I tried to apply the nail polish strips without any type of base coat. It didn’t work the way I anticipated. Once I polished my nails with the New York Colors – Water Street Blue nail polish, I followed the instructions provided by Sally Hansen and I was on my way to glam. I didn’t add a top coat to the design. It’s been about 4 days and my nail polish color and nail polish strips are still in tact. 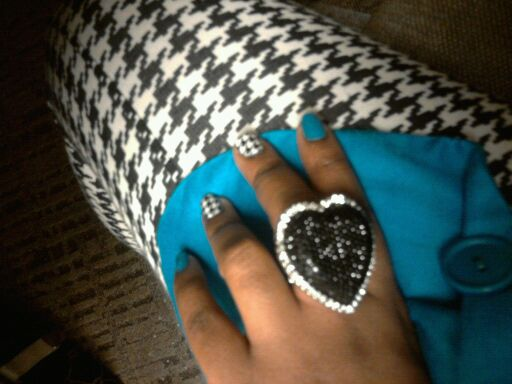 People even questioned if I designed my nails myself. I got compliments on how amazing my nails look. I totally recommend both New York Colors – Water Street Blue nail polish and Sally Hansen’s Salon Effects Real Nail Polish Strips. Categories: Fashion and Beauty, Miss Metropolitan Junkie, Self, Urban Aristocrats, What's Hot in N.Y.C. author.I will be sure to bookmark your blog and will eventually come back later on.